“Strike while the iron’s hot” –unknown proverb. Carpet prices are rarely set in stone. There is almost always room for negotiation. And even if there’s not, almost every store runs sales certain times of the year. So when does carpet go on sale? I’ll cover it in detail below, but it comes down to simple supply and demand. When demand is low, carpet tends to go on sale and your chances of negotiating a good deal are higher. When demand is high, you’re probably paying the stores highest retail prices. Kids are out on winter break. Many people are traveling. Money is tight after buying Christmas and Hanukah presents. People are stressed out and decorating to have family and friends over; the last thing they want to do is clear out their home to have carpet installed. Some salesman may be desperately looking for a Christmas bonus from commission on your sale. This is when the biggest savings happen. Best time to shop: December 21 to January 14. 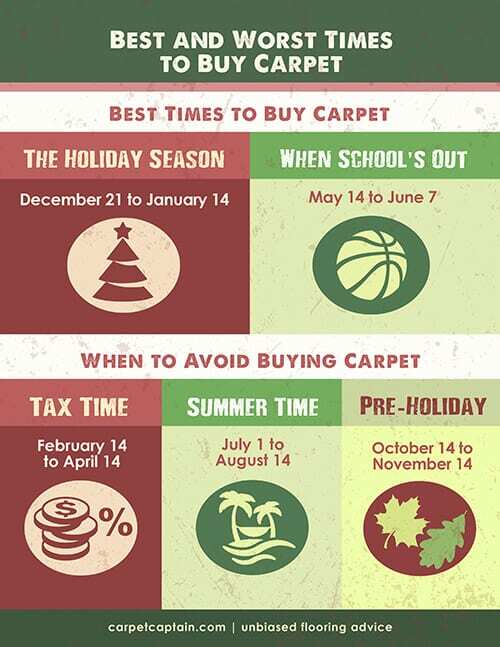 Late spring is a great time to shop for new carpet. School is winding down, so kids have final tests, while adults are planning Memorial Day events and vacations. In addition, this is the calm before peak home sales season. 2nd best time to shop: May 14 to June 7. Everyone is rich. The “unexpected” bonus from the government gives people extra room in their budget, and many people spend this on new carpet. Avoid: February 14 to April 14. The warm and dry summer months are the peak times for remodeling and moving into new homes. With this comes the need for new carpet. The end of this season is marked when kids start going back to school. Avoid: July 1 to August 14. This is a rare time when many families don’t have a lot going on. Summer vacations are over. Kids are now back in the swing of things at school. The next big event is often Thanksgiving with the winter holidays following shortly after. People want their homes to look nice for these events, so sometimes a holiday makeover is necessary. Avoid: October 14 to Novemember 14. You can get a good deal on carpet any time of year, but there’s no question it’s easier when demand is low. If you can’t shop at the best times, maybe you can at least avoid some of the high demand times of the year. And no matter when you shop, don’t be afraid to ask for a good deal. Local stores usually will work more with you, but even big box stores, have been known to haggle. There’s no better deal you can get than making your purchase right the first time. If you overpay or get less quality carpet than you thought, you’ll lose more than you could ever save with a good deal. Check out our free unbiased carpet guide, and you’ll greatly reduce your chances of getting ripped off. Any comments on when to buy carpet? Let me know in the comments below. Captain, We’ll be installing new carpet on our home this fall. We have a slab floor. In the past, there have been several cat and dog urine “incidents”. My question: Should we “treat” the slab for urine, prior to installing new pad and carpet? If so, how should the concrete slab be treated. If the slab was sealed or is going to be sealed, the past pet urine probably isn’t a problem. On the other hand, if you still smell the urine, there’s a good chance it could be a problem. I personally have treated a slab for urine but I’ve heard of a mixture of anything from vinegar/water to bleach/water. The nice thing with a slab is it’s difficult to ruin. This page may also help. Good luck!